A BBC camera crew in the Arctic have captured the most amazing photographs and video footage of the elusive Narwhal – known as the sea unicorn because of their large spiral tusks which can grow up to 2 metres in length. The immense beauty and almost mythical nature of these creatures really captivated me when I watched the footage. Seeing this reminds me all the more that our world is truly a wonderful place and we should protect it in any way we can. So my residents parking permit is up for renewal and the council send me a letter informing me of this along with a form to renew it and a summary of the various options for payment. I fill out the form, enclose a cheque and trudge out through the snow one evening to put it in the post. Given the simplicity of the process and the fact I had followed the instructions enclosed with the renewal notice to the letter, I was surprised to get a phone call today citing a problem. I was even more surprised to discover what the problem was. It would appear that the occupant of the basement flat below my house has also recently decided to avail of a parking permit, except instead of giving his address as the flat he gave it as the house. 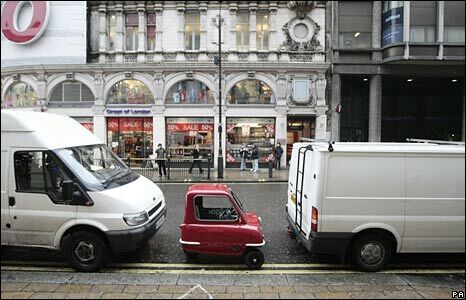 For reasons unknown to me they allowed him to do this even though I already had a permit. The result of this confusion was that I was called to say that I couldn’t renew my permit because there was already one issued for the house; I would have to pay twice as much for a second permit as I was a second occupier requiring a second permit. I replied that I’d love to know who else was secretly living in my house and buying parking permits for it as I certainly hadn’t seen anyone. I demanded that they process my renewal and do so promptly as they had only condescended to send me the renewal forms two weeks before the expiry of the old permit. They said they would “Look into it” and before I had a chance to say anything else they hung up. I would have phoned them back but they had withheld their number. All I can say is that I shan’t be paying any more than what I already have and that if they screw this up and I end up getting parking fines because of their failure to renew promptly and correctly I shan’t even be writing them a letter, I will be passing the issue straight to the small claims court. What with the lack of rubbish collections and running out of grit for the roads, I’m pretty damn sick of Swindon Borough Council at the moment. The BBC were sent this amazing video of a stoat going crazy in the snow. It’s really rather amusing to watch. I guess this one had never encountered such wintry weather before! We’ve had a fair bit of snow in Swindon this week but I’ve been braving it all pretty well and have made it into work every day. One of the best days weather and traffic wise was Wednesday with most people making it into work. How annoyed was I then to come home on Wednesday evening to find that neither my recycling nor my conventional waste had been collected and my street was filled with rubbish sacks on account of residents believing the better weather would result in a collection. Combine this with the council running out of grit on Friday leaving roads slippery and just darn right dangerous, I think I have a fair claim to have a quarter of my months council tax refunded! 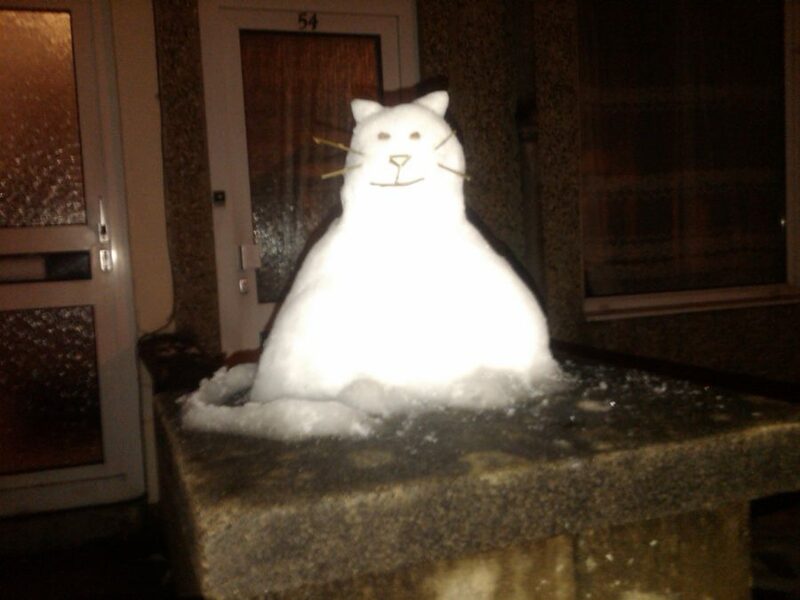 After parking my car this evening I spied this wonderfully sculpted snow cat atop a garden wall. When I awoke for work and peered out of my bedroom window I noticed that my street had taken on a surprising transformation overnight. I attempted to capture the large snowfall on film. 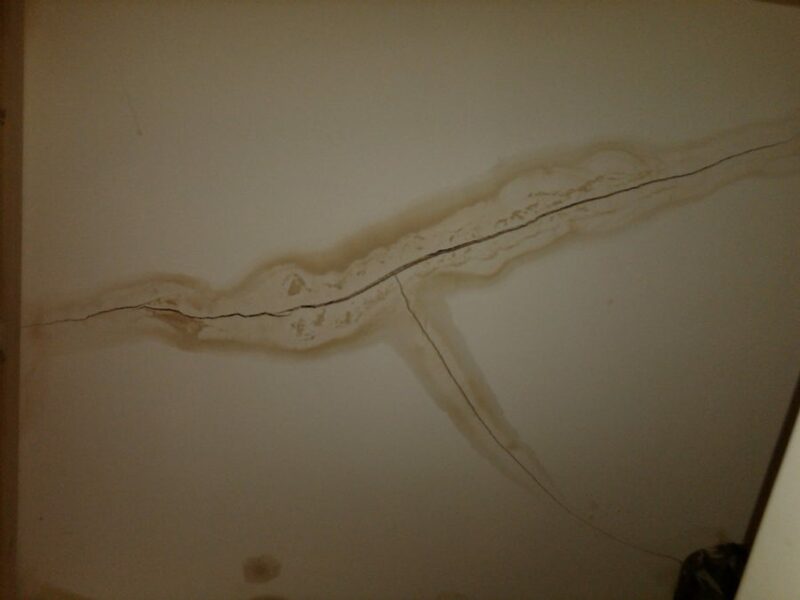 The occasional leaky ceiling problem worsens. This large crack can’t be a good thing.